One of the projects I’ve pored over again and again and again during the past 6 months is Kigaliwire. 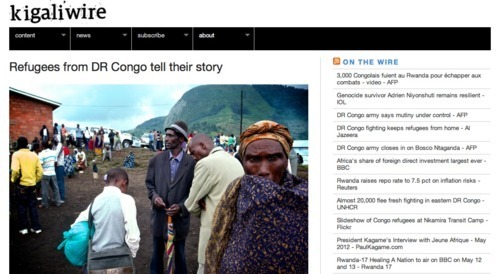 Kigali wire is a social media experiment put together by Graham Holliday. Graham is a social media consultant and trainer, former Reuters correspondent for Rwanda, and freelance journalist. Kigaliwire is now dormant, but Graham has documented every little detail of how he set it up, what worked, what didn’t, and why he decided to do what he did. It’s a goldmine. Really. It’s a precious resource for anyone who wills to take the digital age by the horns as a foreign freelance journalist. One of the things that surprised me the most is what Graham says about his business model. Everyone is up in arms over how the business model is changing, what it should be, and what it shouldn’t be. Graham’s attitude, though, is refreshingly pragmatic. “For all the hugely impressive innovation, the business model appears to rely solely upon advertising – otherwise known as the great white whale that newspapers have been chasing online – and failing to find – since at least the late nineties. And here we are, well over a decade later, and the online advertising model still stubbornly unproven. I can’t help but snigger a little. From a completely unscientific survey, it appears to me that it’s individuals, going it alone, away from the media dinosaurs, or sometimes in partnership with them, who are the only ones making the net work for them.